Unit in the wonderful 'Aquasoleil' complex at the north end of Whitianga's Mercury Bay. Competed late 2005. 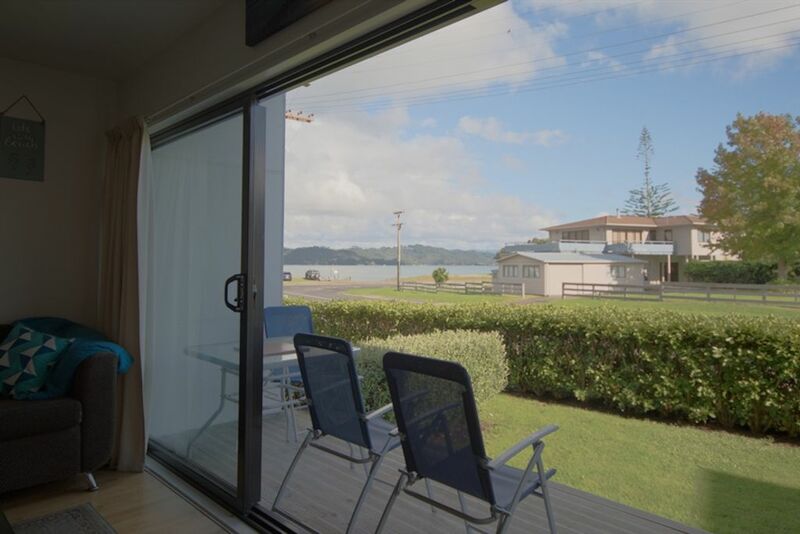 Waterfront location, with stunning and unobstructed views across Mercury Bay to Whitianga and Cooks Beach. A very safe swimming area right in front of you across the main north road out of Whitianga, with the gently sloping and very safe beach, kids small play area, barbecue area and trailer boat launching ramp only footsteps away. Excellent and safe sailing and windsurfing area. A short 3 kilometre drive south to the Whitianga town centre where there is great shopping, excellent restaurants and cafes. A lovely walk along the foreshore to town if you like that. ACCOMMODATION: Each unit at Aquasoleil is individually owned and not part of a rental compex. Only a few are offered by owners to rent on occassion. This one offered by the owner. This is a spacious beautifully appointed apartment. Fully furnished with quality furnishings. All linen, towels etc provided. Auto washing machine and dryer, dishwasher, fridge/freezer, TV and a CD player . Decks on both levels with outdoor table and chairs. 1 week minimum stay over New year. DOWNSTAIRS: A comfortable double converta settee-bed in the lounge if needed (sleep 2). Heated (deep) swimming pool and spa for use within the landscaped complex - available 7am-10pm. Security lock gates on the pool area for safety and security, ensuring only tennants and guests have legitimate access. Guests are expected to maintain a clean and tidy environment whilst enjoying their stay. Guests are also required to comply with complex rules and the complex manager. General cleaning and washing is your responsibility during your stay. A final cleaning will be done on your exit and is included in the price. All bookings must be for a minimum of 2 nights (no exceptions). Minimum 7 nights rental over New Year period - families only. New Zealand national and Auckland regional holiday weekend periods classed as peak periods for rental purposes - as is the Whitianga Scallop Festival weekend in August each year. 10% deposit required within 5 days of booking acceptance or booking cancelled. Great location, very clean and tidy. Vaughan was fantastic, went the extra mile to help us out of a bind. Loved the view of the beach and using the lovely pool. Wonderful to relax on the couch with a drink in hand basking in the sunset. Comfortable beds too! Thanks for a great long weekend. Thank you for your awesome review. It was a pleasure to have you stay in our unit. Glad you had a wonderful weekend. We hope to see you again. Really great location and unit. Close the the water, nice pool in the complex and the units has loads of space. Was nice and clean upon arrival. Definitely good value for money. We had a thoroughly enjoyable stay. Great place - clean, tidy, well equipped, well setup and decorated. Nice to see the sea and a short drive to town. We wished we stayed longer. The kids loved the pool. Would definately like to go back. Great location & amenities, Vaughan was easy to deal with and unit was clean, modern and comfy. Location is great, beach across the Rd, pool and spa on site, Whitianga shops and cafes etc 2kms along the beach. No WiFi but sky TV. Awesome spot.